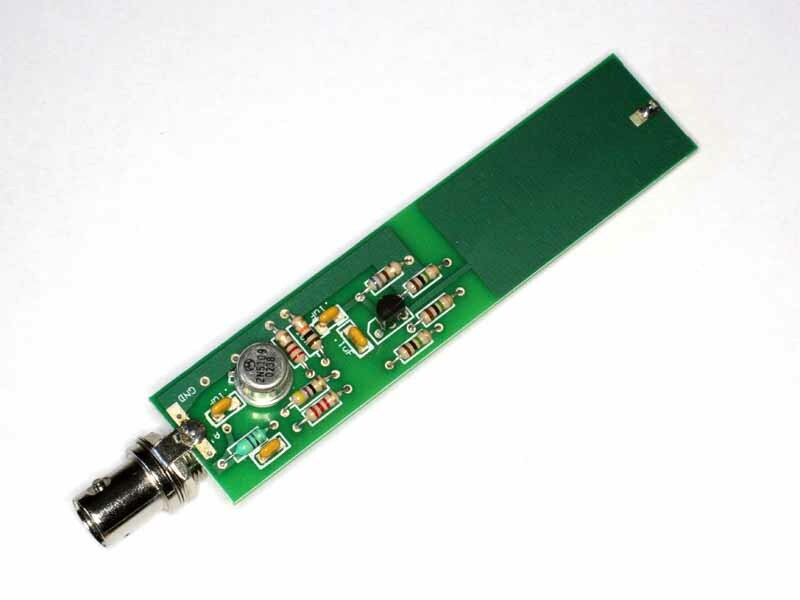 PA0RDT designed a compact active antenna for receiving over the range 10kHz to 30MHz. For the purposes of this article, the integral amplifier is considered part of the antenna system. This article is about a PA0RDT Mini-Whip for receiving on the 600m amateur band. If it is accepted that a whip is a capacitance coupled to the electric field, shape becomes irrelevant, as long as the required capacitance is available. Though the PCB contains a smallish patch for the antenna, PA0RDT's articles suggest that the patch should be extended by a whip of up to perhaps 1m, but he reports 300mm giving good S/N ratio. The longer the whip, the greater the aggregate signal voltage and the risk of degradation by IMD. The tenor of PA0RDT's articles is that antennas can be made sensitive to only or mainly electric field or magnetic field, and that noise is mainly magnetic field and that an E-field probe will select desired signals whilst rejecting noise. The theme of E-field and H-field antennas and benefits is a recurring one in ham radio. Because a radiated wave contains E field and H field in fixed proportions, most of the discussion is bunk. Readers will be aware that proponents of the so-called 'magnetic loops' claim that noise is mainly electric field and loops do not respond to electric fields, exactly the opposite to PA0RDT's proposition. They cannot both be correct, but they can both be wrong! It is true that in the near field, the ratio of E to H is not fixed as it is in the far radiation field due to the induction fields close to the antenna. It is not only not fixed, but the ratio varies with distance, sometimes the ratio is lower, sometimes higher... so IF you did have an antenna that rejected one or the other, it would have to be deployed at a suitable position close to the source to be fully effective. Nevertheless, anecdotes abound that although the signal power captured with the antenna is less than a 'big antenna', the S/N is better. Anecdotes abound but there is a dearth of measurement support for the claims. As mentioned, PA0RDT holds that the patch or whip is capacitance coupled to the E field. To analyse this thing, we MUST consider the outer surface of the coax feed line, to ignore it is to analyse something else. We can expect that the electric field close to and parallel with a short good conductor will approach zero. The incident EM wave will distort around the patch or patch + whip, and likewise around the coax feed line. The amplifier incorporated into the antenna presents an impedance that can be approximated reasonably as around 4pF of capacitance connected between the lower edge of the patch or patch + whip, and the upper edge of the coax shield, the feed point, and it has a voltage gain of approximately unity into a 50Ω load. There can be a potential difference across the feed point. The question then is what is the voltage impressed upon the feed point (or amplifier input) for a given incident EM wave. If the lower side of the feed point was equal in size to the upper side of the feed point and both much less than a wavelength, the unloaded potential difference between the upper part and lower part would be approximately field strength (in V/m) times half the overall length. This is the classic analysis of a short dipole. But, that is not the case, the lower element is an arbitrary length of coax eventually connected to a ground electrode in PA0RDT's article. The coax is long enough that assuming a current distribution is unsafe. This antenna must be installed as much as possible free of obstacles. Any shielding of the electric field reduces the reception. In house, it performs very bad. Common advice is to position this antenna above ALL other antennas nearby, which often means a tall support structure which becomes even more relevant the an explanation of how the thing works. MOM modelling gives us tools for analysing a monopole over real ground. 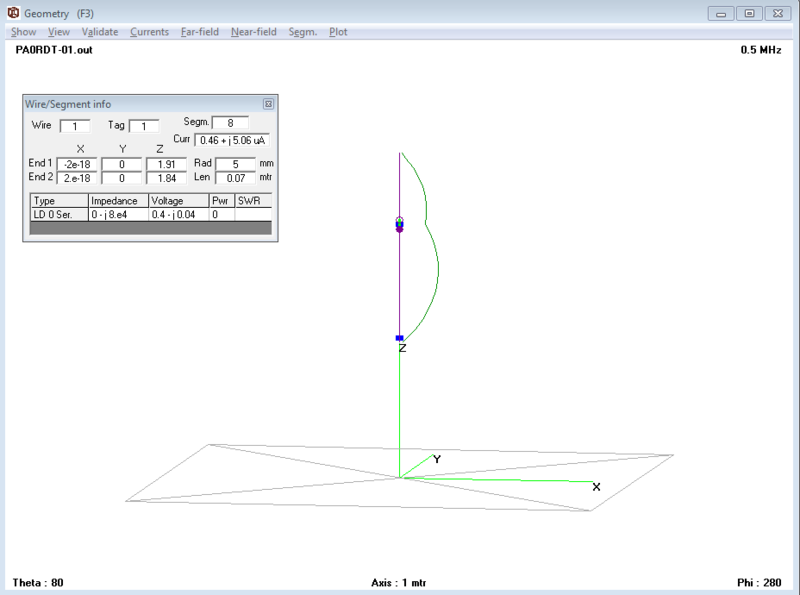 I have approached a number of experts in the field of antenna simulations at home and abroad. It resulted that with current programs it is not possible to simulate the pa0rdt-Mini-Whip ©. These programs decompose an antenna in smaller segments. The segments carry each a different current/voltage. This is calculated to determine the radiation pattern. In an antenna for the electric field this does not work, because only power is available. It is true that NEC-2 has accuracy issues for electrically short segments (as they will be for models of this antenna on LF or MF). However, NEC-4 solves that problem, it handles the segments sizes needed for this article. The last sentence of the quote doesn't make sense, but that is not unusual from antenna designers when modelling tools do not support their propositions. 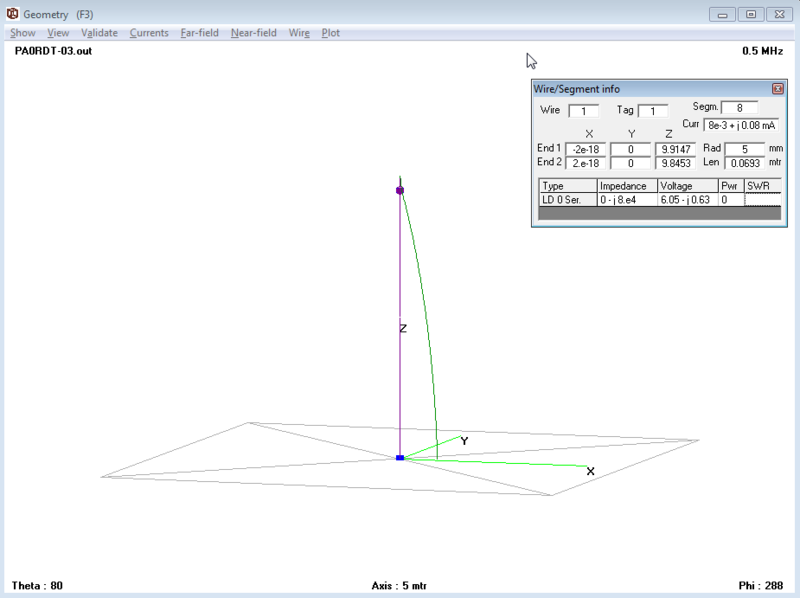 This article uses NEC-4 to model the PA0RDT Mini-Whip antenna system. Fig 2 is from PA0RDT and shows a recommended configuration. This model is a little simpler in using a purely vertical feed line, and a common mode choke at the bottom of the feed line (ie above the earth electrode). Several people advised that the use of a common mode choke in this position reduced noise substantially, lots of discussions on the net describe some form of "isolating transformer" to fix noise problems. A NEC-4 model was built of a 10.4m vertical conductor with feed point approximately 400mm from the top. The feed point segment is loaded with a 4pF capacitance (2pF Cgd + 2pF stray C) to represent the input impedance of the integral amplifier. The bottom segment is loaded with 200µH to represent a common mode choke and 100Ω to represent the resistance of a modest earth electrode. Fig 3 shows the model geometry, and the current distribution as a result of excitation by a 1V/m vertically polarised wave from 30° elevation. The inset shows the current in the feed point node and the RMS voltage developed across the feed point. The voltage developed across the input to the amplifier is 6Vrms in round numbers, or 8.5Vpk in round numbers. So the Antenna Factor FA is 1/8.5/m or -19dB/m which implies a gain of -17dBi... it is more than adequately sensitive for that band... in fact for a broadband device, it may be too sensitive. But the key thing is that when you look at the current distribution due to the incident wave, this is almost identical to an ordinary monopole, save the small distortion near the top feed point. Importantly, the antenna is VERY susceptible in the lower parts to coupling from noise sources like house wiring. It does not look like the isolated voltage probe that is commonly discussed. Experiments varying the characteristics of the common mode choke made little difference until it was large enough to resonate the monopole, which exacerbates the common mode pickup problem by increasing the average current in the lower part of the antenna. Another configuration tested was a PA0RDT Mini-Whip as above but with a 1m vertical feed line to an isolated small battery power receiver (IC-R20) located at 1m above ground level and 30m from any buildings or conductive structures. Fig 4 shows the model geometry, and the current distribution as a result of excitation by a 1V/m vertically polarised wave from 30° elevation. The inset shows the current in the feed point node and the RMS voltage developed across the feed point. The voltage developed across the input to the amplifier is 0.4Vrms in round numbers, or 0.55Vpk in round numbers. So the Antenna Factor is 1/0.55/m or 5dB/m (about 24dB poorer than the 10.4m high structure above) which implies a gain of -41dBi... it is more than adequately sensitive for that band... in fact for a broadband device, it may be too sensitive. Certainly in this test it grossly overloaded the IC-R20 receiver unless the IC-R20 attenuator was active (and there are no high power MF broadcast stations within 60km of the test site). But the key thing is that when you look at the current distribution due to the incident wave, this is somewhat similar to an ordinary short dipole, save the small distortion near the top feed point. An noiseless antenna system that delivers external noise to a linear receiver such that the external noise is 10dB greater than the receiver internal noise achieves S/N that is close to the maximum obtainable (within 1dB of ultimate). Taking a receiver to have a sensitivity of 1µV for 10dB S/N in 2kHz bandwidth, then if we deliver 1µV (0dBµV) of external noise to the receiver, the external noise dominates the total noise. (ITU-R 2009) suggests that the ambient Noise Figure Fa at 500kHz is around 62 - 83dB (quiet site - city site). Table 1 shows the calculated field strength, rx sensitivity, and the maximum FA and minimum gain required so that the external noise is at least 10dB above the internal noise. There are many anecdotes that the PA0RDT can deliver S/N ratio as good as a 'full size' antenna. If the PA0RDT Mini-Whip was able to receive the quiet locality external noise of 2kHz bandwidth at say 1µV to the receiver when the external noise is -8dBµV/m or 0.4µV/m, then the antenna must have an effective height of 1µV/0.4µV/m=2.5m which would usually require a physical height of closer to 5m. This is further evidence to question the claims that the PA0RDT is an e-field probe of some 300mm or so in length do not satisfy the requirement for an effective height of 2.5m to obtain the required receiver input voltage. In the case of the short configuration tested above, the Antenna Factor was -15dB/m and with a 10dB attenuator (necessary to prevent serious IMD), the system is -5dB/m, 18dB better than required for good S/N in a city environment but a little shy of the -8dB/m needed for a quiet location. Now very important condition of this analysis were "noiseless antenna" and "linear receiver". IMD in the PA0RDT amplifier or the following receiver will compromise the performance and noise due to IMD may be much higher than the internal noise of the receiver, and there is the noise of the amplifier itself. A short video demonstrates the PA0RDT Mini-Whip stand alone on a battery receiver. The demonstration supports the analysis above, the performance of the system without a significant length of feed line common mode conductor is seriously degraded, the feed line common mode conductor is a significant part of the antenna system. The Mini-Whip is powered from an independent battery, and additionally a 220µF capacitor is placed across the DC input as some writers have suggested that it may be unstable and additional supply bypassing has improved performance. Otherwise, it is quite according to PA0RDT's design. During testing, both the J310 and 2N5109 were replaced to eliminate risk that one or other may have been faulty. (Lankford 2007) avoids a common mode contribution by isolating his feed line at both ends, the monopole depends on a direct earth electrode for the 'lower' part of the antenna. (Handiko Gesang AS et al 2013) described variations which attempt to isolate the amplifier from feed line common mode current. Several others have described attempts at similar isolation which confirms that the feed line common mode contributes to the standard PA0RDT signal reception. Well, yes it does... in simple layouts it is a monopole or dipole depending on grounding of the lower part, and it is fed at an elevated high impedance feed point. The integrated amplifier does not provide a conjugate match but it does allow obtaining a large part of the signal that is available to a matched load. The Antenna Factor is quite high, and the amplifier is broadband. The designer foresaw issues with overload and IMD, but they remain a feature of the design. An attenuator between preamplifier and receiver may provide some relief from IMD, but the fundamental problem is that the antenna is broadband and provides high sensitivity so there will be a high level broad spectrum presented to the receiver. 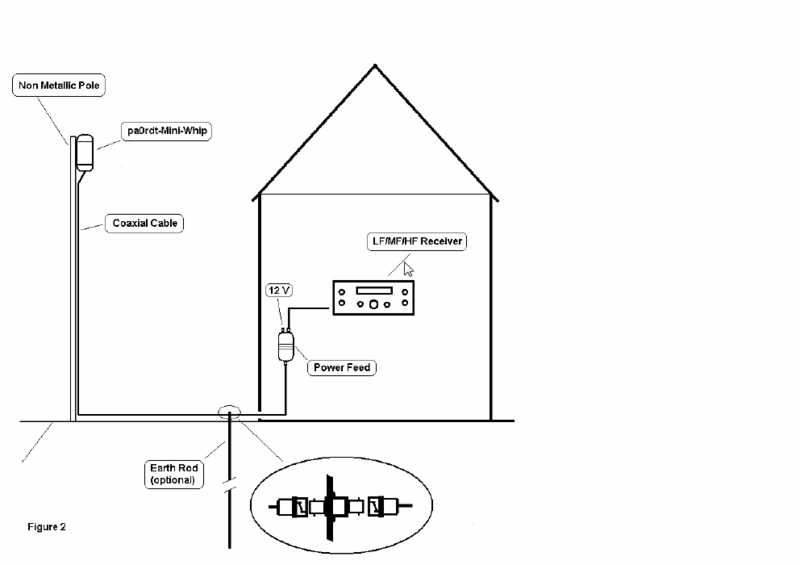 In the implementation shown in Fig 3, the lower part of the antenna feed line (which is part of the antenna) provides a large portion of the total current moment, the antenna is very susceptible to noise from sources local to the lower part of the feed line, sources such as house wiring carrying RF polluted current. The PA0RDT certainly works quite differently to the designer's explanation, and the E-field magic just doesn't hold water. As to whether it works well, that seems to be a personal matter for its users! The kit was inexpensive (about US$20 IIRC) and arrived fairly promptly. Unfortunately it had a faulty 2N5109 on power up and it took out an RF choke (which protected the rest). In testing, the J310 was replaced to be sure that the poor performance was not attributable to silicon... it wasn't! In repairing the unit, the small plated through hole sizes used made removal of components quite difficult, even with a vacuum solder sucker. The unit was modified to add a polyfuse (as recommended by PA0RDT) to the DC injector to prevent so much damage in the future. One of the features of the many variations of active antennas of this type is the use of inverse parallel diodes connected to an antenna, presumably for protection of the input device. The thinking being that the diodes will conduct only when the impressed voltage exceeds the 'turn on' voltage for the diode. This is a naively simple model of the way that a diode operates. Practical diodes exhibit non-linear current at voltages between zero and the nominal 'turn on' voltage and connection of diodes to antennas runs a great risk of creation of intermodulation products over a wide frequency range that might be disruptive on site and to other nearby communications systems. Connecting diodes to antennas in this way is plainly irresponsible! Bakker, Roelof. nd. The pa0rdt-Mini-Whip. http://dl1dbc.net/SAQ/Mwhip/pa0rdt-Mini-Whip.pdf (accessed 02/07/13). Bakker, Roelof. Sep 2011. The pa0rdt-Mini-Whip ©, an active receiving antenna for 10 KHz to 20 MHz. http://www.arimodena.it/progetti/mini-whip/doc/article-pa0rdt-mini-whip.pdf accessed (02/07/13). Ehrenfried, Martin. Active antenna overview. http://g8jnj.webs.com/activeantennas.htm (accessed 05/07/13). PAØRDT for LF and HF Application. IEEE 1983. IEEE Standard Definitions of Terms for Antennas (IEEE Std 145-1983). ITU-R. Oct 2009. Recommendation ITU-R P.372-10 (10/2009) Radio noise. Lankford, D. Sep 2007. Simplified complementary push-pull output active whip antennas. Trask, C. Jan 2008. A high dynamic range amplifier for active short monopole antennas. 1.02 18/09/2015 Copied to owenduffy.net.